Imi-Train is a joint project of the EU commission and EFPIA. One of the deliverables is the implementation of the Specialist in Medicines Development. A concept which was generated over the years by Pharmatrain, a constituent of Imi-Train. The current Imi-Train deliverable is the implementation of the SMD concept in Italy as a pilot run which further should pave the way for a global roll out. Currently, academically-qualified (in medicine or life sciences) people working in medicines development are trained on the job, undertake continuing professional development (CPD), and participate in university training courses to achieve a secondary diploma and/or master degree. Both tracks will lead to an individual acquiring a certain array of competencies across multiple domains. So far, there is no qualification / degree / award available in most countries which certifies this described background or achievement, and the PharmaTrain SMD Certification concept & programme aims to fill this gap. SMD is a competency-based, workplace-centred education and training certification programme in medicines development, comprising a knowledge base of the PharmaTrain Syllabus, delivered & assessed through modular curricula, and the acquisition & demonstration of competencies for medicines development across seven domains of the competency curriculum. PharmaTrain and Imi-Train have started to build a global Certification Board, have worked out the necessary SOPs and policies and prepared the ground to start a pilot in Italy and soon in Japan. Italy volunteered to be the first European country to implement the SMD programme. Why to choose Italy for the first pilot? First of all, Italy has a very large association of Pharmaceutical Medicine: SSFA has more than 900 members, is very active (on average, we organize – thanks to the dedication of several members active in working groups – more than 20 seminars every year), and has a very good scientific reputation among professionals, regulators and all people involved in drug development. Secondly, Italy has a large population of professionals who, in the last ten years, got the master title in Pharmaceutical Medicine: more than 15 University post graduate master courses gave the master title to about 1000 pharmaceutical professionals. And this people are the ideal candidates to join the SMD programme. 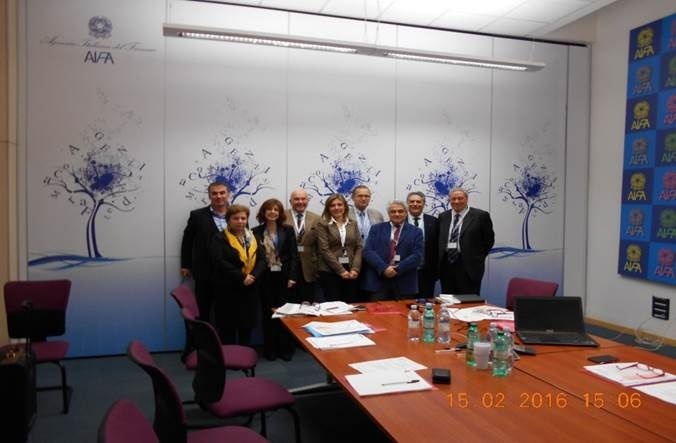 Finally, the Italian SMD team sponsored by Imi-Train and PharmaTrain created a good network among regulators, scientific associations and directors of master of science programmes in medicines development, in order to get a strong support: most of these people were appointed as members of the national PharmaTrain Certification Board, who convened on February 15, 2016 at AIFA (the Italian Drug Agency) for the inaugural meeting: the enclosed picture was taken on that event. Two Italian stakeholders meetings are part of the plan. One meeting took place in June 2015, the second will take place in May 2016 in Rome. The official start of the programme in Italy will be June 1st 2016. Some interviews about Pharmatrain, SMD and the educational efforts in place are now available from the site of PharmaStar, the most influential and followed on-line medical magazine in Italy, which is distributed to all MDs and other health professionals every Sunday.